Located just about 250 Km from Hyderabad is the small hill town of Srisailam, famous for the Srisailam or Mallikaarjun swami (Siva) temple. It is one of the 12 Jyortilingams and one of the few where shaktipeeth (mother goddess) is also present at same place. We decided to take a road trip in car to Srisailam. Once you reach close to the new Airport of Hyderabad you will start seeing board to Srisailam and just continue to follow them. We left very early in the morning hoping to avoid traffic, smart decision there were hardly any vehicles on the road in early morning. 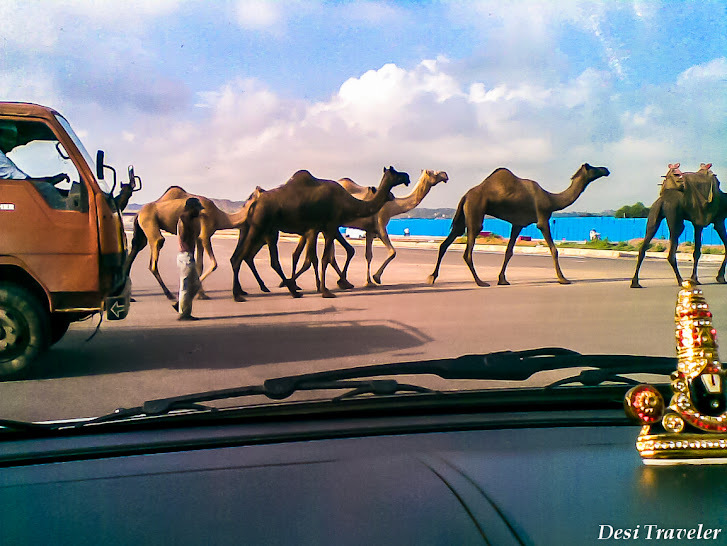 Although nobody has warned us of a caravan of Camels was passing by and shepherds taking a stroll on the highway with their sheep. Thus all the advantage of starting early was lost. But I am not complaining as the kids were very happy to see the camels and later the sheep specially the little lambs, soon singing “Mary had a little lamb”, only to be joined by us in the chorus. Though the road signs are good to Srisailam, the road in the plains was not good, fortunately in the ghat section it was recently built and we were able to cover good time. Traveler tip: No restaurants etc on the winding hill road so better pack your own food as once you enter Nallamalla forest it is very sparsely populated and not many choices to get a decent meal. So it will be a good idea to stock accordingly specially if you have kids with you. Just before you enter the town there is small Ganesha temple called Sakshi Ganesha,where the devotees stop and offer their prayers to lord Ganesha. It is believed that Ganesha will keep a record of your visit, and if you do not visit the same you will not get the credit to visit the Srisailam temple. So your sins will not be washed away as per the old belief. Going further you are welcomed by huge statues of Nandi the bull, an Idol of Saraswati with her Veena (Indian string musical Instrument), and a few more. They are good to click pictures of, though do not have any historical signification as are all recently built in the hill town. The main temple is the main attraction of the town and during religion festivals etc there is a minimum of 2-3 hours of waiting time, even on normal days you much need around an hour to have darshanof the lord. Once you have seen the Siva temple right next to is the temple of mother goddess and is a must visit. It is called Bhramaramba Temple and is dedicated to Parvati the consort of Lord Siva. 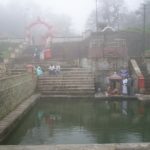 Parvati is believed to have prayed in form of a bee here to lord Shiva. The temple built in Dravidian style. It is also believed that Goddess Durga had taken the form of a bee and worshiped Lord Shiva here and selected this holy place as her abode. After seeing the main temple you can explore the many small shrines in the complex dedicated to Shiva and his various forms. Both the temples are beautifully made of solid stone and the exact origin of them is not clear, but must be easily 1000+ years old. Once you seen the temples there is not much to see, you can visit some of the other temples that are all around. 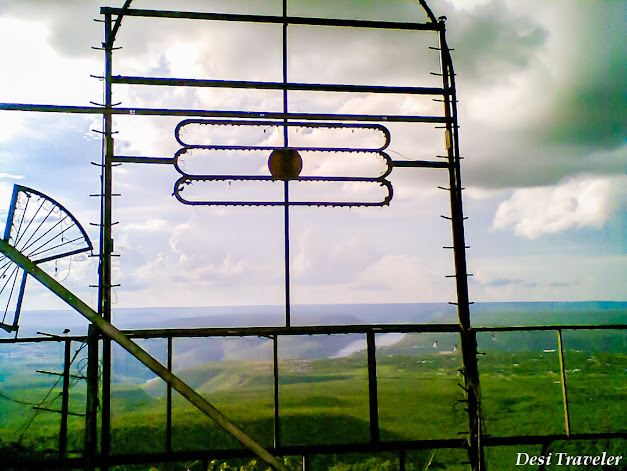 One of the famous one is Shikaresvara Temple called so as it is the highest point in the Srisailam area and you get a beautiful view of the wwhole valley. There is huge neon sign of Shivalingam on one of the peaks that is visible from miles in the night. 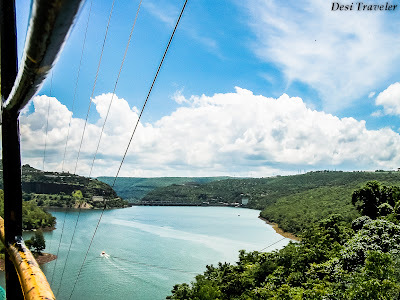 For the kids you can take them on the ropeway on the Krishna River and it goes all the way down in the valley above the reservoir of the 512 meter long Srisailam dam. The view is breathtaking when you are suspended in the air in the rope-way. We did an overnight stay in Srisailam and stayed in AP tourism’s Haritha guest house, which can be booked online. It is a small basic hotel serving meals and comfortable rooms like in any government-owned property. They add food to chilies and not adding chilies to food but you do not have many choices in the small place. The small bazaar around the temple is the only market for visitors and you will get a lot of trinkets, handicrafts good etc. The tea sold by some of the tea vendors in the market is very refreshing and one of the better Indian Masala tea you will have in small town India. On the return journey we took a longer route back through the back roads via Nagarjuna Sagar Dam, the huge dam that supplies water to a large parts of the states of Andhra Pradesh and Telangana, I will write in some other post about the same. 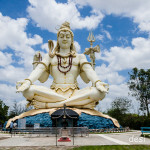 What To do in Srisailam: The Sri Mallikarjuna Swamy Temple ( Shiva Temple ) in Srisailam is one of the oldest Shiva temple in country and is considered one of the 12 sacred Jyotirling temples of Lord Shiva. Also it has the rare distinction of Brahmarambha a Shakti Peetha Temple in the same complex, making this temple a very rare one where Shiv and Shakti are so close by. We were very happy with this visit but my apologies for the poor picture quality as I did not had my camera with me so all pictures were clicked by cell phone. 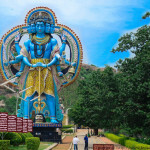 Also you will notice that I have not given any main temple pictures, as they are available at a lot of place on net, I am giving pictures that give a slightly different flavor of Srisailam the temple town. Here is the google map link for driving directions to Srisailam from Hyderabad. Thanks for reading do check our Facebook page, and feel free to comment and share with your friends. I plan to go to Hyderabad and visit Srisailam and back … Please suggest a good hotel to stay with family in Hyderabad. Suggest one from where I can easily nice to Srisailam and a hotel which I can depend for car hire as well. 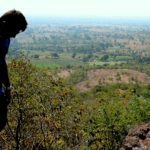 Dear Veeresh: We are a hobby blog not a travel agency. You can search here to find good hotels. As you plan to go via car area near Airport will be good as Airport directly connects to the Srisailam highway. would like to travel early in the morning from hyderabad to srisailam , at what time ghat road will opens in day. I am not sure of the exact time but to the best of my knowledge the Forest Ghat Section road to Srisailam will be closed by 8 Pm or 8.30 Pm and will open by 6 Am, so plan your trip accordingly. Better check with the Forest department, as it also may depend on the season. ghat road closes at 9 Pm every day and opens at 6 Am…they dont allow any vehicals between this time in any case…. Thanks that is very useful information. 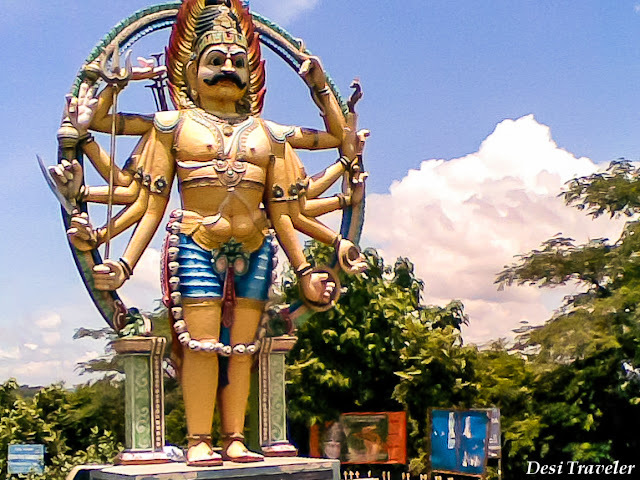 Dear desi traveller…..appreciate your efforts in describing your trip to Srisailam. 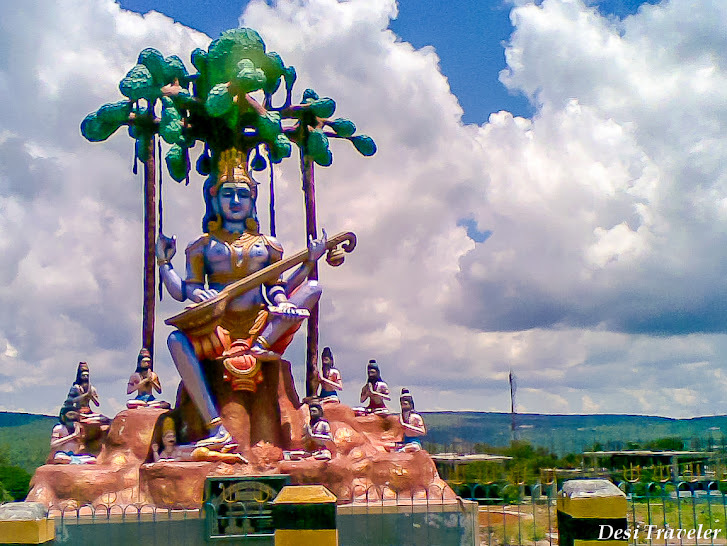 Wish to point out an error by you….for all the readers….the huge statue you mentioned is NOT of Goddess Saraswathi but it is the form of Lord Shiva who is called Lord Dakshinamurthy! He is renowned as the guru and guide for learning and knowledge. Dear Shiva: Thanks for correcting, appreciate your taking time and writing to me, I have corrected the same… thanks a lot. Hi Caroline: Welcome to desi Traveler, best time for seeing the Dam full will be during and post monsoon, anytime after mid July. 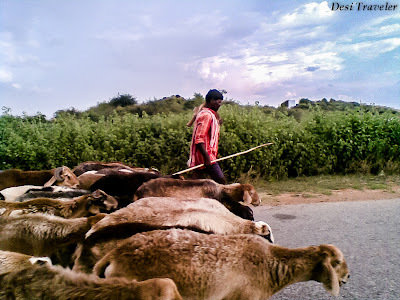 i have had a bad experience with goons trying to rob us on the way back from Srisailam …. and then we heard that it is a common issue on the route where the driver you hire informs a gang that the tourists are not Telugu and then even before u realize .. there is some slight race which happens between your car and an unknown car .. ur driver says something and the other car overtakes and blocks ur cars road .. then 5-6 people can comeout and make life hell for u . they will take away the cars ,… keys and then driver would surrender .. and u are forced to take out settlement money to save yourself and family .. its a daily stuff !! I almost felt like owning a gun and killing them all .. the bloody goons who kept adding up !! the place is nice very nice infact !! Hi My Say: Sorry to hear about your bad experience, though I was warned to not go there in the night, day was supposed to be safe. Though I have not heard any incidents in recent past as GHAC regularly goes in this area. I would once love to go here as it is the one of the twelve which is remaining in my list. This will help me . Lovely place. We had visited way back when the hydel project was being commissioned. Walked through the place too:-). The temple too was very nice, what with going near the main deity and almost touching. (usually not allowed in South). I am not sure whether it is permitted now. Nic to note the rope-way and the view of the reservoir! Hi Pattu Raj mam, Srisailam must have been 100 times greener in those days.Fortunately it is still very nice, though getting commercial. I am not sure they allow now to touch the deity as we did not tried as the idol was in a Sanctum Sanctorum. 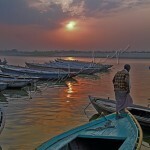 The pictures are very beautiful and so is your post, I never realized they were clicked from a mobile camera. Loved taking a tour of the temple town in its different flavors, to see those neon lights twinkling at night from far must be an amazing experience. Srisailam is an awesome place… thanks. 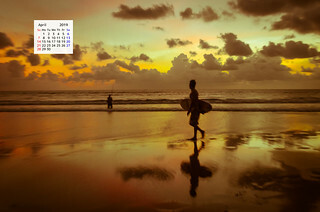 Thanks Niranjan…it is a great weekend get away… thanks. Would love to visit this place. The view from the rope way is stunning. Nice post.